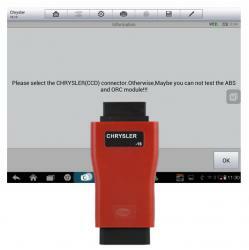 Hi, I have recently purchased an AL619 and when trying to diagnose SRS system on 1997 Jeep Wrangler it is asking for a Chrysler CCD adapter. Is this the correct adapter and does it come with the coms cable. If adapter does not come with coms cable please also give part number of coms cable so that I can purchase both. Yes, this is the correct connector. The back of the connector is a standard OBD2 connector. You will plug the cable from you AL619 into the adpater and then plug the adapter into the vehicle. No addition cables are required.